Mars’ moons were likely formed by a ring of debris blasted into space after the Red Planet was hit by a massive impact and, when the moon Phobos disintegrates in 70 million years, another ring may form. Mars is currently known as the “Red Planet” of the solar system; its unmistakable ruddy hue is created by dust rich in iron oxide covering its landscape. But in Mars’ ancient past, it might have also been called the “Ringed Planet” of the inner solar system and, in the distant future, it may sport rings once more. The thing is, we live in a highly dynamic solar system, where the planets may appear static over human (or even civilization) timescales, but over millions to billions of years, massive changes to planetary bodies occur frequently. And should there be a massive impact on a small rocky world — on Mars, say — these changes can be nothing short of monumental. In new NASA-funded research published in the journal Nature Geoscience, planetary scientists have developed a new model of Mars when it was hit by a massive impact over 4 billion years ago. This catastrophic impact created a vast basin called the Borealis Basin in the planet’s northern hemisphere and the event could be part of the reason why Mars lacks a global magnetic field — it’s hypothesized that a powerful impact (or series of impacts) caused massive disruption to the Martian inner dynamo. But the impact also blasted a huge amount of rocky debris from Mars’ crust into space, ultimately settling into a ring system, like a miniaturized rocky version of Saturn. Over time, as the debris drifted away from Mars and settled, rocky chunks would have formed under gravity and these “moonlets” would have clumped together to form larger and larger moons. So far, so good; this is how we’d expect moons to form. But there’s a catch. After forming in Mars orbit, any moon would have slowly lost orbital altitude, creeping toward the planet’s so-called Roche Limit — a region surrounding any planetary body that is a bad place for any moon to hang out. The Roche Limit is the point at which a planet’s tidal forces become too great for the structural integrity of an orbiting body. When approaching this limit, the closest edge of the moon to the planet will experience a greater tidal pull than the far side, overcoming the body’s gravity. At some point, something has to give and the moon will start to break apart. 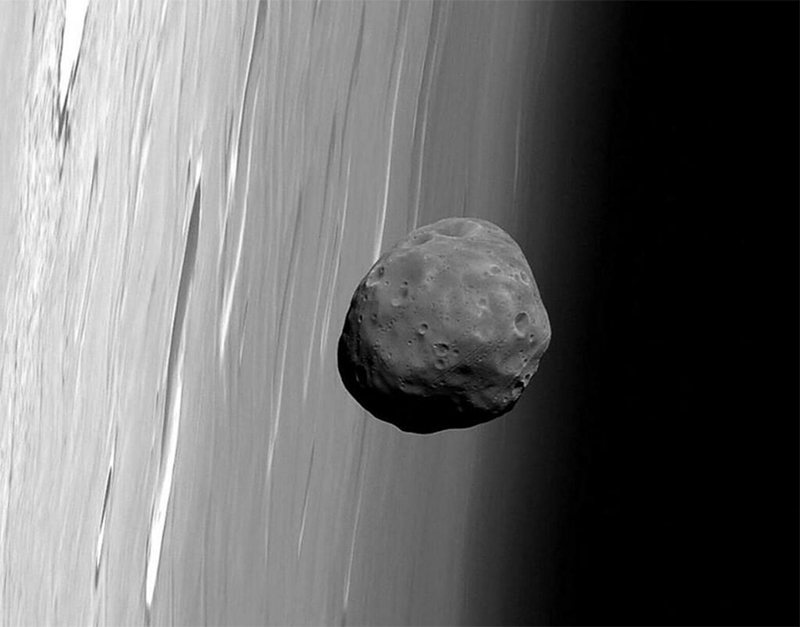 And this is what’s going to happen to Phobos in about 70 million years. Its orbit is currently degrading and when it reaches this invisible boundary, tidal stresses will pull it apart, trailing pieces of moon around the planet, some debris falling onto the Martian surface as a series of meteorite impacts, while others remain in orbit. The research, carried out by David Minton and Andrew Hesselbrock of Purdue University, Lafayette in Indiana, theorizes that mysterious deposits of material around Mars’ equator might have come from the breakup of ancient moons that came before Phobos and Deimos. According to their model, each time a moon broke apart to create a ring, the next moon would be five times smaller than its predecessor. In short, Mars and its moon may appear to be pretty much unchanged for billions of years, but the researchers think that up to seven moon-ring cycles have occurred over the last 4.3 billion years and Mars is on the verge (on geological timescales) of acquiring rings once more. Fascinating.